Joy Creek Photo Archive (c) all rights reserved Fuchsia 'Herbe de Jacques' is a trailing fuchsia with very interesting leaves. When they are young, their pale green color is mottled in cream and pink but as they expand and age, though they maintain their mottling, they also develop even paler margins. In substance, the leaves appear somewhat succulent. Their misted color sets off the rich red and purple of the simple flowers. This was released by an American named Schneider in 1978. 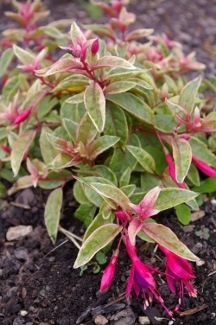 It is included on "Hardy Fuchsia" lists in both England and the Pacific Northwest. June to autumn. 2.5 ft. x 2.5 ft.